DAY CPM served as Project Manager and Owner Representative for the new International Terminal built by the Port of Newport. DAY’s role for this $26 million project included budget & schedule development, architect/engineer coordination & contract management, and CM/GC selection. DAY CPM also led coordination among participating agencies. Prior to rebuilding the terminal, DAY CPM focused on site cleanup and remediation. The USS Pasley and USS Hennebique, two World War II concrete cargo vessels that were loaded with bunker fuel, asbestos, oil, and gravel, make up the dock foundations of the original terminal. DAY CPM coordinated with the Oregon Coast Alliance, Department of Environmental Quality, US Army Corps of Engineers, and the Port of Newport to provide careful and thorough cleanup and remediation services, particularly for the SS Pasley, which also requires removal. As of November 2011, the Pasley was completely dismantled successfully and the contaminated materials were hauled off-site for proper disposal and recycling. The Hennebique was thoroughly cleaned as well. The new terminal was rebuilt to protect aquatic habitat and water quality in Yaquina Bay. The Port of Newport Terminal is one of only three deep draft terminals on the coast of Oregon and will serve as a significant port for international commerce. The rebuilt terminal includes two docks, warehouse space and administrative offices. 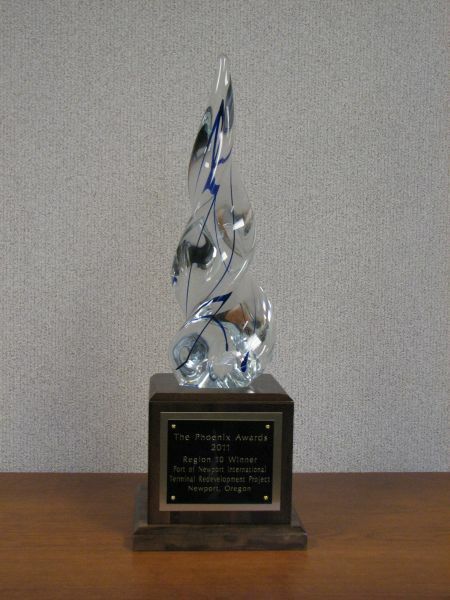 Port of Newport’s International Terminal Project was selected to receive the 2011 National Phoenix Award. Joshua Dodson, DAY CPM Principal, represented the Port of Newport at the award ceremony in Atlanta, Georgia on May 16, 2013. The Phoenix Award represents excellence in brownfield redevelopment.